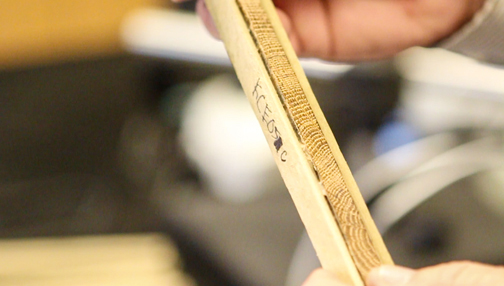 At UT’s Laboratory of Tree-Ring Science, students and researchers take tree-ring samples from wooden objects such as violins or log cabins. The samples are placed under a scanner that creates high-resolution images. Software is then used to measure the rings and find a match for a specific span of years. Dr. Henri Grissino-Mayer, associate department head and the James R. Cox Professor of Geography in the University of Tennessee’s Department of Geography, and his team of students bring wood samples back to the lab in Knoxville to determine the age of the artifact. 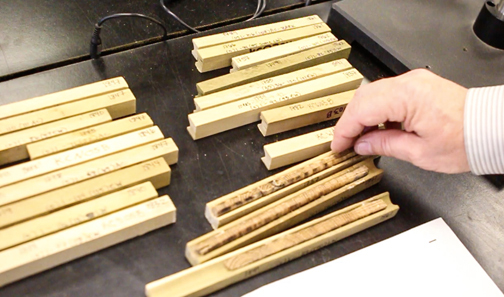 When the wood gets to the lab, a core sample is taken, sanded down and then placed under a specialized scanner with very high resolution to get images. From there, software is used to isolate the rings and the combination of scanning and digital imagery produces measurements. That provides the number of wide and narrow rings. Then comes the statistical dating for calendar years. The pattern of growth is unique, just like a fingerprint for DNA matching. One ring equals one year, and the outer ring is the stop date, or the cutting date, of that particular piece of wood or log. “Trees have a pattern of wide and narrow rings that show how they responded to the climate every year they were growing,” Grissino-Mayer says. “That unique pattern exists only in one place, which helps us isolate where the tree grew. We have a reference of tree-ring data made from living trees across the United States, so we have data that is anchored in time. That lining up of the innermost tree rings shows when growth began, and then it’s a matter of counting out to get to the cut date. “Using our tools, the trees can tell us when they were born, and when they were cut,” Grissino-Mayer adds.